Cyclist, advocate, and entrepreneur Megan Ramey is the founder of Bikabout. Cyclist, advocate, and entrepreneur Megan Ramey, based in West Cambridge (until she moves to Oregon later this summer), started Bikabout in 2014. The national online travel resource shares information on all things cycling, including bike-friendly lodging, tips on traveling with bikes, renting them, and where to ride them. She has published 24 free downloadable city guides, along with 43 self-guided tours (many with voice navigation), day trips, and weekend getaways. Ramey, 39, cycles with her husband, Kyle, and their 6-year-old daughter, Annika. Q. What inspired you to start Bikabout? Are you a long-time cyclist? A. I grew up in Wisconsin, where biking is just kind of in your blood. I biked to school, and later we moved to Peachtree City, near Atlanta, which has a series of golf-cart paths great for walking and biking. In college, my car was totaled and I had to bike everywhere. That completely changed my mindset of what transportation should look and feel like. I was inspired to create guides during a trip to Oregon, when we used the book “Hop in the Saddle: A Guide to Portland’s Craft Beer Scene, by Bike.” I could relax and let the book lead the way, my husband had his craft beers, and Annika got to nap. Q. What do you want Bikabout to accomplish? A. I want to make cycling attractive, accessible, and eliminate all the barriers. Some people will never bike, but a lot of people are curious about it, but they’re either scared or sweat averse. They see it as an intense recreational activity, but I’m trying to simplify that, to show that biking is a way to visit a city and see all its nooks and crannies that you’d never see otherwise and is an efficient means to get to places. Q. 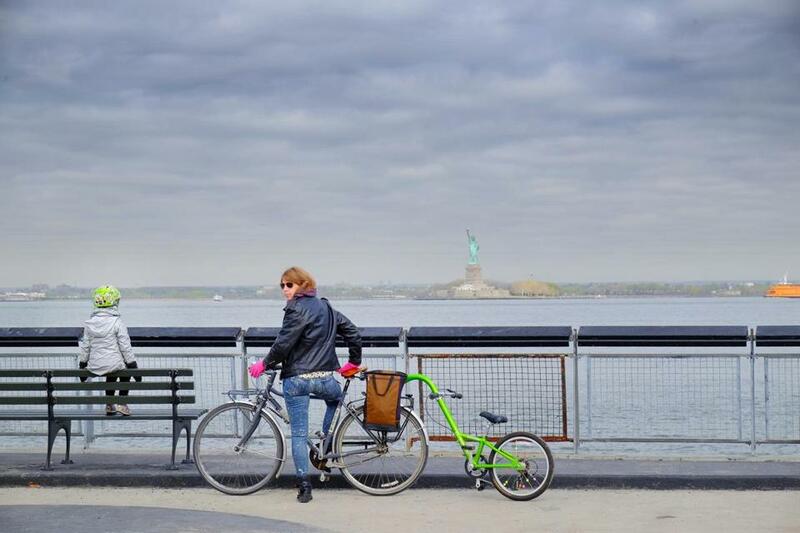 When you travel as a family, do you rent bikes or bring your own? And what are the best ways to carry young children? A. We almost always rent. When Annika was younger, we preferred the mini seats in the front with a windshield. She’d take four-hour naps while we were biking. Trailers are also great nap machines. Once Annika was out of the toddler stage she went in a seat behind the bike. Q. Which North American cities are best for visitors on bikes? A. In the US, Portland and Minneapolis. Minneapolis has these interstate highway of bikeways where you never have a car beside you unless you exit into a neighborhood. Also there’s arts and culture and parks everywhere. Instead of the interstate approach, Portland has “neighborways,” so you get the feel of the neighborhoods. Montreal and Vancouver are even a class above. A. Amsterdam was the original inspiration for a biking city. I know that Copenhagen, Oslo, and Berlin are great, but I haven’t been. Part of traveling by bike is that it’s not really about the bike, it’s that you want to feel like a local and have an infrastructure where you don’t have to think about it too much. The Netherlands is definitely like that. Q.What American city surprised you the most? A. Greenville, S.C. It blew me away. It’s a beautiful city. . . . They put a ton of money into Falls Park, the trail there and the Swamp Rabbit Trail, and so many businesses have popped up around it. Q. What about cycling in Boston? A. I’ve had some close calls. But what I also say about Boston is that because it’s a great walking city, it can be a great biking city, with one caveat – you need to choose your routes very carefully for a low-stress experience. Take one wrong turn and you’re in trouble. Q. Your blog has a popular item about cycling to Logan Airport. Have you done that? A. We cycled there when we went to the Netherlands and left our bikes for two weeks. The route involves taking the Blue Line, then it’s 100 percent off road to the airport. At the new car-rental building, there’s covered bike parking, and you can take a bus to the terminal, or you can park your bike at Terminal A or E.
Q. What’s next for Bikabout? A. We want to see Bikabout grow and become the destination bike-tourism website. In tandem, we want to open a boutique bike hostel in Hood River, Ore. Oregon is turning the Historic Columbia River trail into a bike trail. They want to make it like the Danube of America. It’s very exciting.